DMXReady gives web professionals that leg up they need to deliver web solutions their customers are asking for. 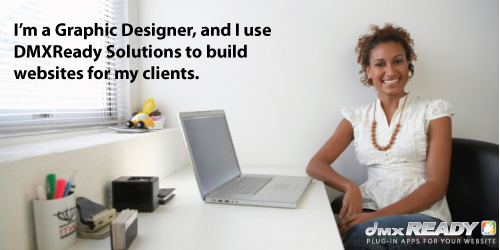 With DMXReady, you don't have to be a programming guru to offer great website solutions. Simply choose your solution, modify as necessary, or get a Freelancer to customize your applications for you. It is still faster and easier than building from scratch! DMXReady applications put more money in your pocket with less time spent designing/building/testing/debugging scripts built from scratch. By using an ASP application "template" as a shortcut, you save a lot of time but still make a lot of money. Or pass the savings on to your client to make your bids more competitive. And since most DMXReady apps include an unlimited usage developer license, you can make even more money down the road. With a pre-configured Access database, pre-built ASP pages, and easy installation integration with your website, you can use DMXReady applications right out of the box. Or give your clients added value by customizing each application to their needs. Even if you have never scripted before, customizing a DMXReady app is not difficult for the average Web Professional. In fact, many of our customers have told us that they learned HTML, CSS, ASP just by customizing our apps. Give your clients the power and the ease of use that comes from database-driven content without scripting from scratch with DMXReady applications. Improve your web skills and make more money. With DMXReady applications, you are in control. Checkout the usage case below and see for yourself!